If you want your dog to be healthy and stay healthy, you have to pay attention to what it eats. Most people turn to canned foods when they want to feed their dogs because it is easily accessible and it does not require any cooking or preparation. However, a lot of canned foods are questionable and may not supply the dog with the appropriate nutrition. 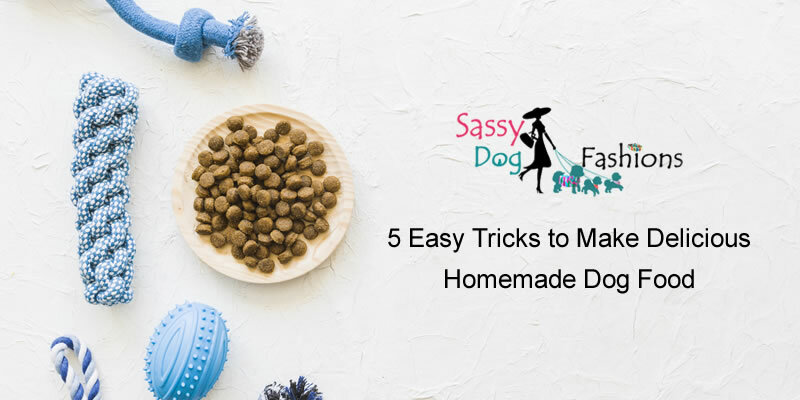 In today’s post, we’ll discuss some easy tricks to make delicious homemade dog food. Your dog is part of your family so you should ensure it gets exactly what it needs in its diet just like you do for the other members of your family. However, you should never include any of the following into your dog food: peppers, beer, pomegranate, chocolate, nuts, garlic, gum, grapes, avocado, shrimp, onions, walnuts, almonds, marshmallow and mushroom. Organs: This should be about five percent of animal products. Fish: This should be one ounce per pound of meat, but ensure you feed your dog cooked fish. Dairy: This is a good source of protein and calcium; however you should limit any type of cheese that is not a cottage and ricotta cheese. Eggs: A big dog can have a whole egg per day. Starchy Vegetables: Potatoes, beans, and pumpkins supply carbohydrate calories that are very food for dogs, especially active dogs. However, they must not be fed to them raw and they should be limited for overweight dogs. Leafy Vegetables: They can be fed in any desired quantity. Grains: Oatmeal, pasta, brown rice, quinoa, and barley are good grains for dogs. However, they must be well cooked. Dog food should contain about 1000 mg calcium per pound of food. Some calcium-rich foods that are you can feed your dogs are Kale, tofu, rice (not white rice), edamame, sesame seeds, broccoli, almond, and soy milk. Add fish oil or cod liver oil to their diet on days you don’t feed fish or on days you don’t feed too much fish. To ensure your homemade diet can supply adequate vitamins and minerals, you can add supplements to their food.